I actually didn't know today was Star Wars day, when I was struggling to think of what to write. 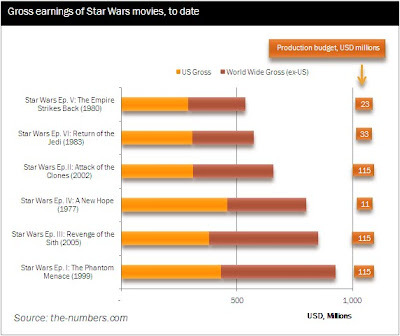 Anyway, i'm a bit shocked with the gross earnings data for these movies. I kinda always have a soft spot for RoTJ, and obviously not so much for the later movies with way too much CGI and bad Natalie Portman lines. Regardless, its important to remember that it takes 3 (or more) Star Wars movies to match the same gross earnings as Titanic!...Makes you wonder which movie spawns more crazy fans out there. well, I actually thought for adjusting for inflation and population growth, but it didn't quite work out. Mainly because the only comparable one with this methodology is the first week gross earnings. ...and nobody really heard of Star Wars before 1977, so its kinda hard to expect a huge fan base prior to Episode IV.